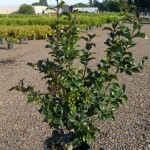 A dense, upright, somewhat conical shrub with spiny, deep green, glossy leaves. 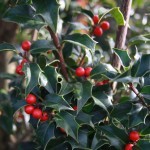 If planted near a pollinizer, it will have large red berries. Avoid planting in poorly drained soils; prefers full sun to part shade. Useful as a hedge, screen or an accent in the landscape. Developed by Katherine Meserve, and introduced by The Conard-Pyle Company.